When we don’t want a sandwich for lunch we often make these ‘pizza parcels’ as they are really quick, and easy, to make. Noah and I love to eat them! James just loves to make them. They are from the recipe in Ella’s Kitchen book First Foods, which our whole family have been eating from very happily. I was totally surprised by how delicious the meals are. I don’t know why I was surprised – I guess because I just think of mush when I think of Ella’s Kitchen. I don’t like the idea of sausages and potatoes in the same little pouch. Personal taste, I’m sure, and that’s why we did baby led weaning with both boys, because I personally would like to see what I’m eating and know which bits I like, and I’ve projected this idea on my boys. Since we love it so, I thought I’d share this very simple lunch with you. 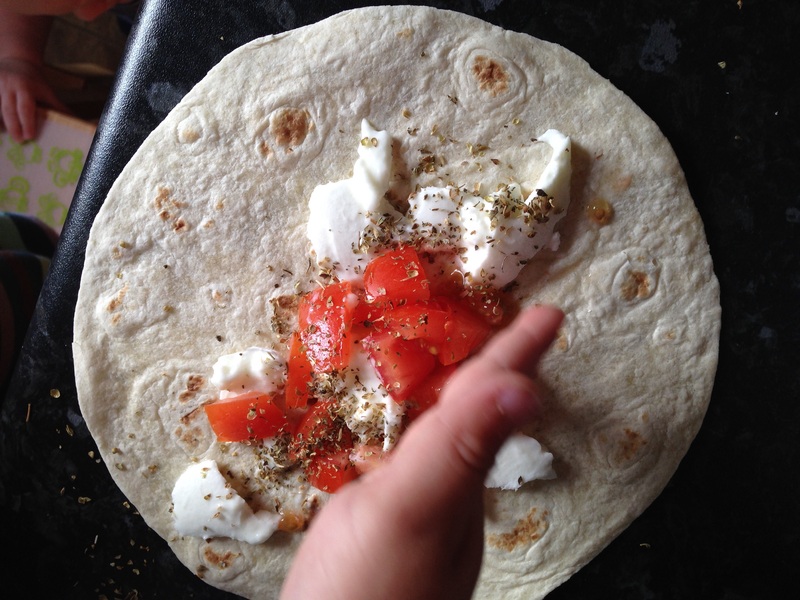 You need cheese, a tomato and some oregano, along with a tortilla wrap. Chop the tomato up. Grate the cheese if you are using cheddar or similar. We usually use cheddar, but the actual recipe suggests mozzarella. Warm the wrap in a pan first, because that makes it easier to fold. Then put all the ingredients in a small pile on the tortilla. James enjoys sprinkling the oregano, in particular! 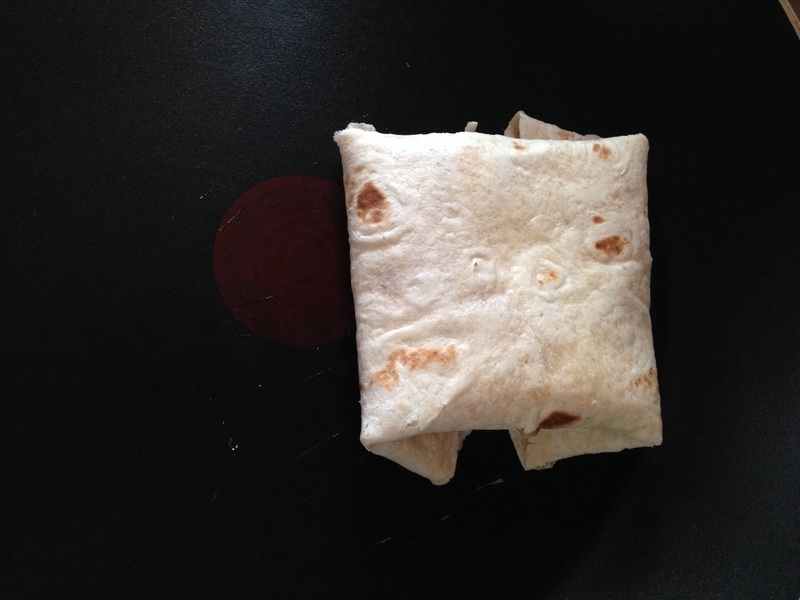 Fold the wrap into a square, and then put that, join down, on the pan. After a minute or two, flip over the parcel. Wait a little while and then serve. 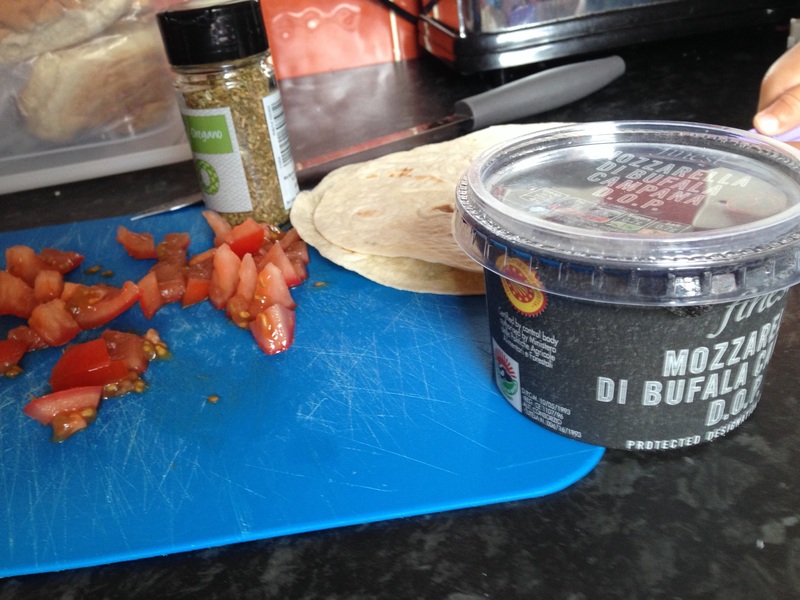 If you have used mozzarella (though pretty much all cheeses and juicy tomato!) there will be liquid coming out of the wrap when you lift it to your mouth. Watch out, because that’s going to be hot! So please, bear that in mind when serving these pizza parcels to children. These are also fantastic for packed lunches and picnics. 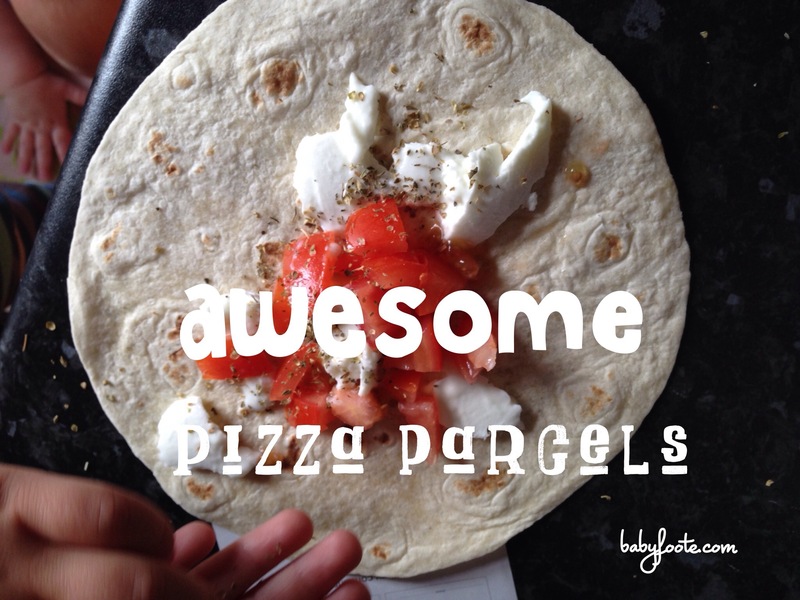 We love pizza parcels either hot or cold. Yes, we fall in and out with them too, but I find a pack keeps for a while in a zip-lock bag. Hope you try them and love them too! So simple, so effective! They’re much better warm, too! Yum! This sounds like a delicious, quick and easy recipe – I’ll have to give it a go! We have wraps a lot (like my son has them every day in his packed lunch) but I love this take on them! Can’t wait to try it!